21 PIECES LED LIGHT:There are 21 pieces LEDs built-in our vanity mirror can be adjustable ,allow you makeup in the dark or poorly lit areas. And LED lights brightness adjust by the touch sensor switch. 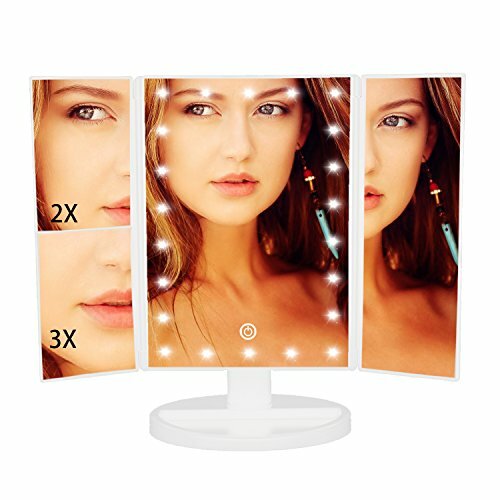 1X/2X/3X MAGNIFICATION MIRROR:The LED lighted makeup mirror features 3 panels magnifying levels,a wide-angle viewing for you to see clearly your facial features,and make a more perfect makeup with each detail taken care of. DOUBLE POWER SUPPLY:This Led mirror can either operated by 4 pcs AAA batteries (not included) or USB cable (usb wire included)to make it work,mirror can not store power itself. 180-DEGREE FREE ROTATION:The lighted makeup mirror stands on your countertop can be freely adjusted and fixed a perfect and comfortable viewing angle.